Elmer Louis Anderson was born near Ventura, IA, son of Lars and Lena (Pedersdatter Benerud) Anderson. He was baptized July 29, 1883 in Ellington Prairie Lutheran Church and was confirmed there August 20, 1898. He received his elementary education at Concord School. 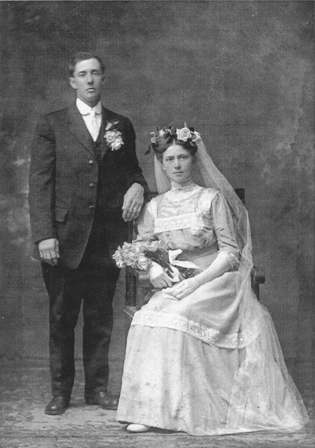 He married Bertha Sara Hall (1884-1941) on November 16, 1910, and they farmed at Ventura for 40 years on the farm where he had been born and had grown up. Elmer and Bertha Anderson had five children: Lester (1911-1989); Earl (1913-1993); Robert Norman (1915- ); Bert (1917-1952); and Carrie, Mrs. Bernard Greiman (1921- ).